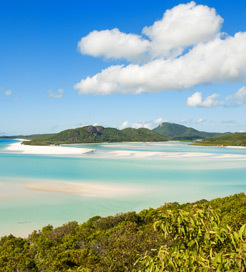 Scattered along the central Queensland coast lie 74 stunning islands, forming the Whitsundays. Well known for pristine white beaches and clear waters, this group of islands is home to some of the most idyllic beaches on the planet. Whitehaven beach is famous for its pure white silica sand, which some argue is the finest in the world. The islands are protected by the Great Barrier Reef which results in tranquil waters and colourful ocean beds. The lack of waves and large number of islands make it an ideal sailing destination. The famed Hamilton Island Race Week is a must see if visiting in August, which sees hundreds of yachts navigating the islands in style. Bars and barbecues are set up and parties go on all night, making a truly unforgettable beach experience. A range of daytime activities are available too. These include diving, cruises, sea kayaking and hiking along the lush, sloping landscape. All of which can be organised on Airlie Beach, the mainland port or some of the other islands. Hamilton Island is the most visited and popular, offering luxury resorts and exciting water sports. Whilst on the island you’ll discover winding walking trails, breath taking views and sample some of the many upmarket restaurants and bars. Daydream Island is another popular destination. Although it’s smaller in comparison and only has a single resort, it’s perfect for families and still offers lots things to do. A scenic flight tour is a great way to fully appreciate these beautiful islands. Air Whitsunday Seaplanes tours include snorkelling and picnic lunches on Whitehaven beach as well. Away from the bustling tourist spots are over 50 inexpensive camping sites, which are easily accessible by boat. Regulated by Great Barrier Reef Marine Park Authority, campers are required to bring sufficient water, food and a tent. Ferries from the mainland take you to Daydream and Hamilton Island from Airlie Beach and Shute Harbour, by Whitsunday Airport. Getting to the airport is simple, with Virgin Australia and JetStar currently providing daily flights from Brisbane. Tiger Airways provide direct flights to and from Sydney on Tuesdays as well. The ferry routes are operated by Cruise Whitsundays, who provide frequent 30-45 minute journeys with 9 sailings a day from Airlie Beach and 3 a day from Shute Harbour. Their purpose built vessels are equipped with large viewing decks, bars and wide screen televisions, ensuring an enjoyable and comfortable journey. For more information, please visit our Ferries from Australia to Whitsunday Islands page.